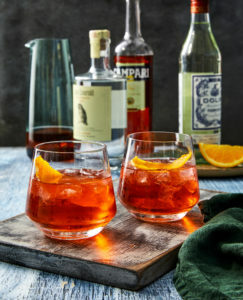 The Negroni originated in Italy and is considered an aperitif, or drink served before a meal to stimulate the appetite. This is one of my favorite drinks, and I prefer it served ice cold, up, but it can be served over ice too. It’s got a hint of pleasing bitterness and is so refreshing. One of my favorite memories of this drink is a dinner John and I had with our daughter Emma after she had been in Los Angeles for about a month (our first time seeing her after she moved away from home). We sat outside at this lovely restaurant surrounded by twinkling string lights and the whole thing just felt enchanted. We each had a predinner cocktail—John, a martini, Emma, a glass of Champagne, and a Negroni for me—while we talked and looked over the menu. The conversation and the meal were perfect, and it was just one of those evenings you never forget. I’ll always associate this drink with happy memories. Stir together the gin, Campari, and sweet vermouth in a rocks or martini glass. Add ice, and garnish with orange peel, if desired, or serve up without ice. TIP: You can also mix all ingredients into a cocktail shaker with ice, shake, and strain into a martini glass or Champagne coupe. Get a personalized copy of Martina’s Kitchen Mix for your Valentine by ordering before Sunday, Feb. 10th at 4pm CST.